Even though I have taken some flak, in the past, for putting this page up and publicising this aspect of the hobby, it's my true belief that newcomers to the hobby should be made aware of the risks. Why hide the fact that rc planes crash sometimes?? 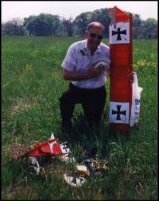 If you have any photos of crashed rc airplanes that you think should be shown on the RC Airplane World Hall of Shame, then send 'em in! Maybe we can all learn a thing or two from each other!